Church of Jesus Christ of Latter-day Saints. Salt Lake Temple, IGI reference to Endowments for the dead, 1893-1970; heir indexes, 1924-1956; baptisms for the dead, 1941-1970, Salt Lake City: Filmed by the Genealogical Society of Utah, (1959-1979) , Film Number: 184279, Page Number: 783, Reference Number: 20581. Guy S. Rix, History and Genealogy of the Eastman Family in America, , at https://books.google.com/books?id=mNwRhOz28XgC . Concord, N.H.: (1901) , pp. 131-2. 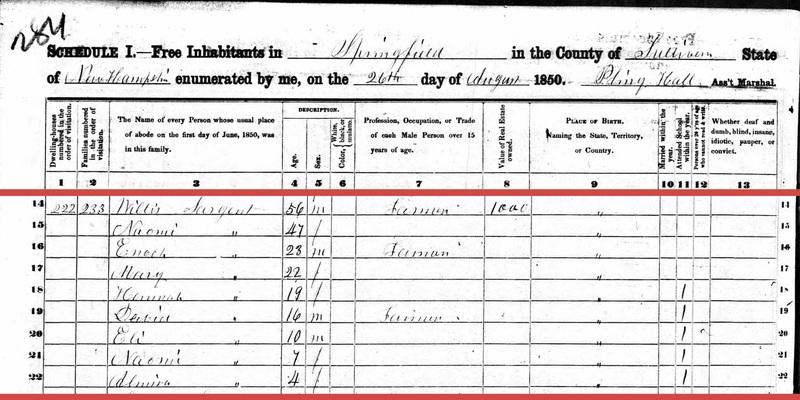 "New Hampshire Birth Records, Early to 1900," database with images, FamilySearch (https://familysearch.org/ark:/61903/1:1:FLG4-M88 : 12 December 2014), Ichabod Sargent Johnson, 18 Nov 1795; citing Hampstead, Rockingham, New Hampshire, United States, Bureau of Vital Records and Health Statistics, Concord; FHL microfilm 1,001,008. "New Hampshire Birth Records, Early to 1900," database with images, FamilySearch (https://familysearch.org/ark:/61903/1:1:FLG4-SY3 : 12 December 2014), John Johnson, 16 Apr 1798; citing Hampstead, Rockingham, New Hampshire, United States, Bureau of Vital Records and Health Statistics, Concord; FHL microfilm 1,001,008. 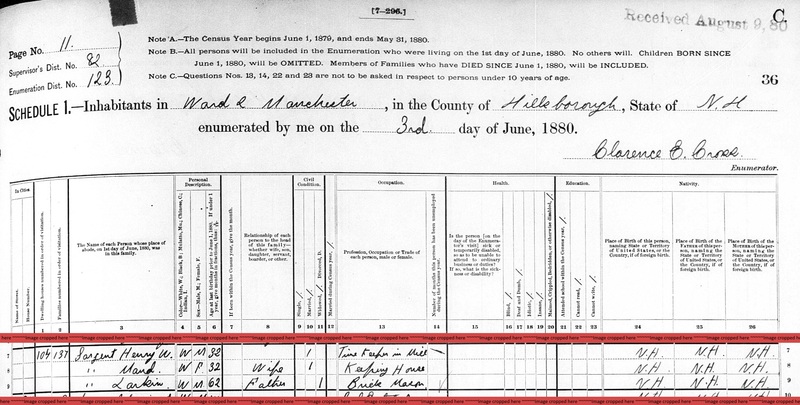 "New Hampshire Birth Records, Early to 1900," database with images, FamilySearch (https://familysearch.org/ark:/61903/1:1:FLG4-9QH : 12 December 2014), Jesse Johnson, 10 Apr 1800; citing Hampstead, Rockingham, New Hampshire, United States, Bureau of Vital Records and Health Statistics, Concord; FHL microfilm 1,001,008. "New Hampshire Birth Records, Early to 1900," database with images, FamilySearch (https://familysearch.org/ark:/61903/1:1:FLGW-1XJ : 12 December 2014), Hannah Johnson, 30 Jun 1802; citing Hampstead, Rockingham, New Hampshire, United States, Bureau of Vital Records and Health Statistics, Concord; FHL microfilm 1,001,008. "New Hampshire Birth Records, Early to 1900," database with images, FamilySearch (https://familysearch.org/ark:/61903/1:1:FLG4-SLL : 12 December 2014), John Johnson, 14 Aug 1804; citing Hampstead, Rockingham, New Hampshire, United States, Bureau of Vital Records and Health Statistics, Concord; FHL microfilm 1,001,008. 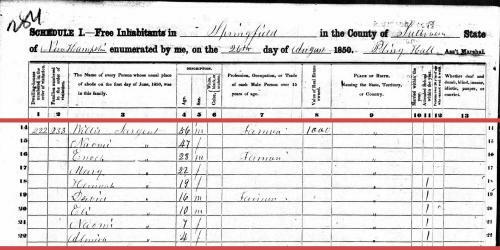 "New Hampshire Birth Records, Early to 1900," database with images, FamilySearch (https://familysearch.org/ark:/61903/1:1:FLGW-1FJ : 12 December 2014), Hannah Johnson, 27 Mar 1807; citing Grafton, Grafton, New Hampshire, United States, Bureau of Vital Records and Health Statistics, Concord; FHL microfilm 1,001,008. "New Hampshire Birth Records, Early to 1900," database with images, FamilySearch (https://familysearch.org/ark:/61903/1:1:FLG4-72P : 12 December 2014), Nathan Johnson, 19 May 1809; citing Grafton, Grafton, New Hampshire, United States, Bureau of Vital Records and Health Statistics, Concord; FHL microfilm 1,001,008. "New Hampshire Births and Christenings, 1714-1904," database, FamilySearch (https://familysearch.org/ark:/61903/1:1:FDJH-1W5 : 12 December 2014), David Johnson, 20 Mar 1813; citing ; FHL microfilm 1,001,008. "New Hampshire Birth Records, Early to 1900," database with images, FamilySearch (https://familysearch.org/ark:/61903/1:1:FLG4-WP1 : 12 December 2014), Ruth Jane Johnson, 13 Jan 1815; citing Grafton, Grafton, New Hampshire, United States, Bureau of Vital Records and Health Statistics, Concord; FHL microfilm 1,001,008. Church of Jesus Christ of Latter-day Saints. Salt Lake Temple, IGI reference to Endowments for the dead, 1893-1970; heir indexes, 1924-1956; baptisms for the dead, 1941-1970, Salt Lake City: Filmed by the Genealogical Society of Utah, (1959-1979) , Film Number: 184196, Page Number: 1128, Reference Number: 25598. 1880 United States. Census Office. 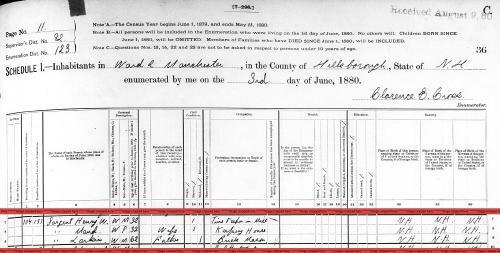 10th census, 1880 federal population census, Washington, District of Columbia: National Archives and Records Service, ([19--]) , Census Place: Manchester, Hillsborough, New Hampshire; Roll: 763; Family History Film: 1254763; Page: 36C; Enumeration District: 123; Image: 0073. "New Hampshire Marriage Records, 1637-1947," database with images, FamilySearch (https://familysearch.org/ark:/61903/1:1:FLF3-WCD : accessed 14 April 2016), Henry W. Sargent and Josephine Quimby, 20 Jun 1889; citing Biddeford, York, Maine, Bureau of Vital Records and Health Statistics, Concord; FHL microfilm 1,001,308. Find A Grave Memorial# 80043267. Ezra Scollay Stearns and M T Runnels, History of Plymouth, New Hampshire, Cambridge, Mass. : University Press, (1906) , p. 618. William Richard Cutter, New England Families, Genealogical and Memorial: A Record of the Achievements of Her People in the Making of Commonwealths and the Founding of a Nation, Lewis historical publishing company, (1914) , Vol. 2, p. 956. Vital records of Amesbury, Massachusetts to the end of the year 1849, , at https://archive.org/details/vitalrecordsofam00ames . Topsfield, Mass. : Topsfield Historical Society, (1913) , p. 218. Vital records of Amesbury, Massachusetts to the end of the year 1849, , at https://archive.org/details/vitalrecordsofam00ames . Topsfield, Mass. : Topsfield Historical Society, (1913) , p. 219. Vital records of Amesbury, Massachusetts to the end of the year 1849, , at https://archive.org/details/vitalrecordsofam00ames . Topsfield, Mass. : Topsfield Historical Society, (1913) , p. 223.